There are many reasons why you might want to know how to start a blog. 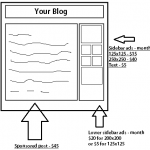 Maybe you have a business and want to supplement your online activity with a blog. Good idea! Maybe you want to start an online diary of your life. That’s fun too! Maybe you want to start a fashion blog, or a food blog, or a fitness blog. 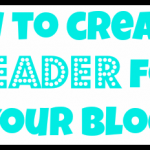 There are so many types of blogs out there to start! The key is starting. You have all of these ideas, so get going on them! If you know anyone who is thinking of starting a blog, or who you think should, please pass this post on to them so they can get it done quickly and easily! 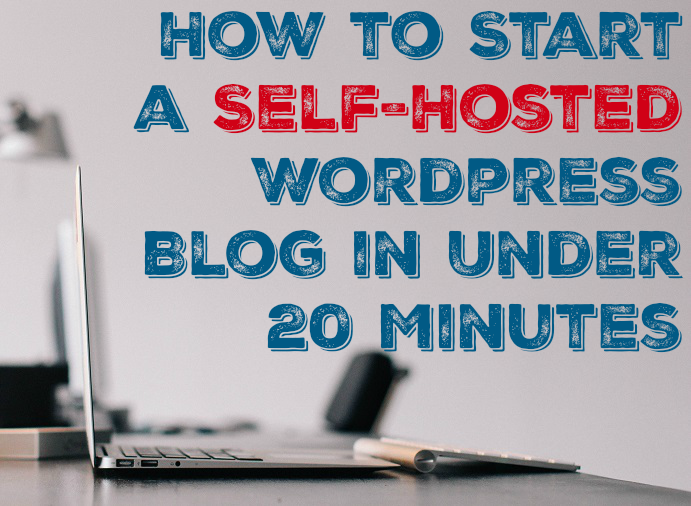 This post will serve as a step-by-step guide to show you how to start a blog in under 20 minutes. If you follow along with the post while creating your blog, you should have a new blog up and running in no time! I will state upfront why I recommend HostGator. 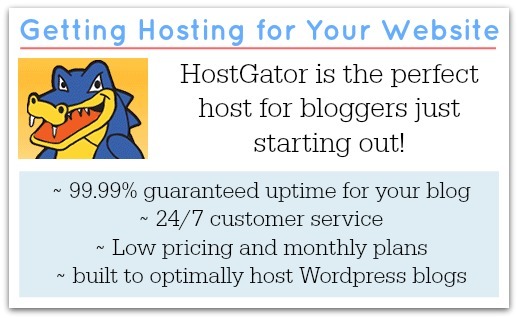 For starters, HostGator guarantees 99.99% uptime for your site. WordPress recommends only 3 hosting companies for running their platform – HostGator is #1. A+ customer service available 24/7/365. Another reason is that their pricing is amazingly good. (Save 25% more with code MOREFROMYOURBLOG) Lastly, as you are about to find out, the set-up from the ground up is very easy. It is important that you know that I am a HostGator affiliate. Therefore, while it costs you NOTHING EXTRA, I get a little something when I refer people to HostGator. None of that changes anything. They are a great company, affiliate program or not. The truth is, I could become an affiliate of just about any of the hundreds of hosting companies out there, but I choose to recommend HostGator. Ok, so How do you Start a Blog? Don’t register your domain on this screen, it will be easier to do it the way I describe below. Once you’ve found a domain name that is available, think long and hard about it and make sure that it is the one you want. That will be something that you’re never going to want to change. Now that you know of a domain that you like and is still available, it’s time to get some cheap web hosting to go with it. You’re going to want to head over here, where you can sign up for HostGator and score awesome hosting for as low as $3.96/month! Save 25% more with coupon code MOREFROMYOURBLOG as well! To start, I recommend the baby plan. You can upgrade ANYTIME. Upon entering your domain, you will see that it is available and it will be automatically added to your cart. You will then be given the option to add other top-level domains to your cart such as the .net and .org versions of your domain. If you’re really worried about someone trying to snap those names up, go ahead and add them to your cart, although this can get pricey. I generally do not do this and only buy the .com domain. Here, you’ll be able to select which plan is for you and how long you want to sign up for. I recommend the baby plan, because you are able to add more than one domain to the hosting plan. 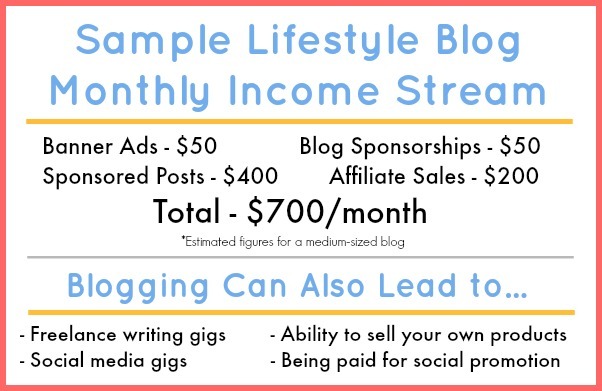 The price difference is so small and most bloggers are likely to add another domain. I also recommend signing up for as long as possible, as you will save money doing so. That said, the nice part about HostGator is that you can sign up for just one month at a time if you want. So, select your hosting package and billing cycle length and then create an account username and password. Scroll down and enter your billing info. Their site is 100% secure. Note: if at any point during this process you get stuck, feel free to contact me (info at the bottom of post) or jump on the phone and call HostGator at 1-866-96-GATOR and they’ll be happy to help you out. They’ll auto-check a few of these, so make sure you un-check them. 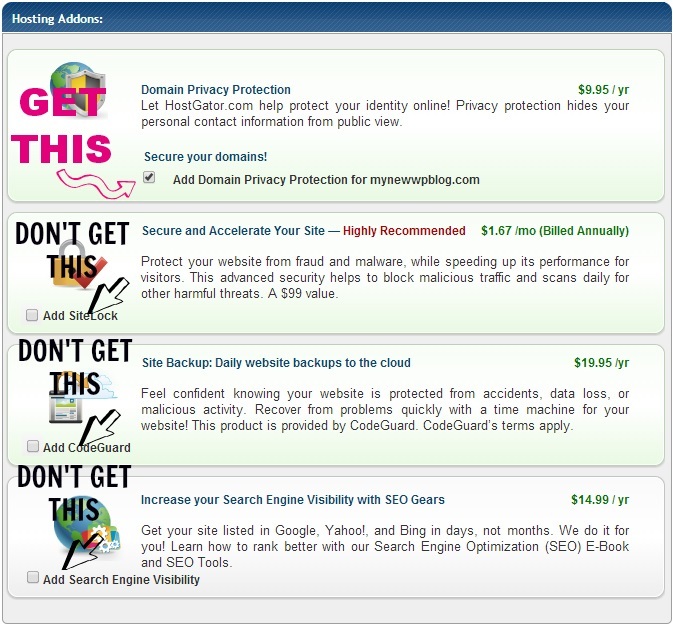 Domain Privacy Protection – this is a big deal. If you don’t choose this, anyone can look up who owns your site and your registration information will be public. This includes your email address, physical address and phone number. You want domain privacy protection. Secure and Accelerate Your Site – WordPress does this quite well as it is. So does HostGator. You don’t need this extra. Site Backups: Daily Backups of Your Site to the Cloud – you want to do this, but you just don’t have to pay for it. WordPress offers a variety of automatic backup plugins including BackWPup, Backup and WPB2D. Increase Your Search Engine Visibility with SEO Gears – This is not necessary. Follow SEO best practices that I cover on this site and you’ll do just as well. The next section will have you enter a coupon code. Enter MOREFROMYOURBLOG to save 25% on your order! Check the box that you agree to their terms and move forward. Once payment is complete, you’ll receive an email within a few minutes confirming your purchase and containing important information. I recommend forwarding this email to another email address that you own so it is in two places just in case. In the email will be a link to your control panel aka cpanel. You’re going to want to click that. You’ll have to login. The login and password will be in the email as well. Now that you’re passed that screen, you should get to your cPanel. This is the “back end” of your site and where all of the key technical matters will take place. Click QuickInstall to move forward. 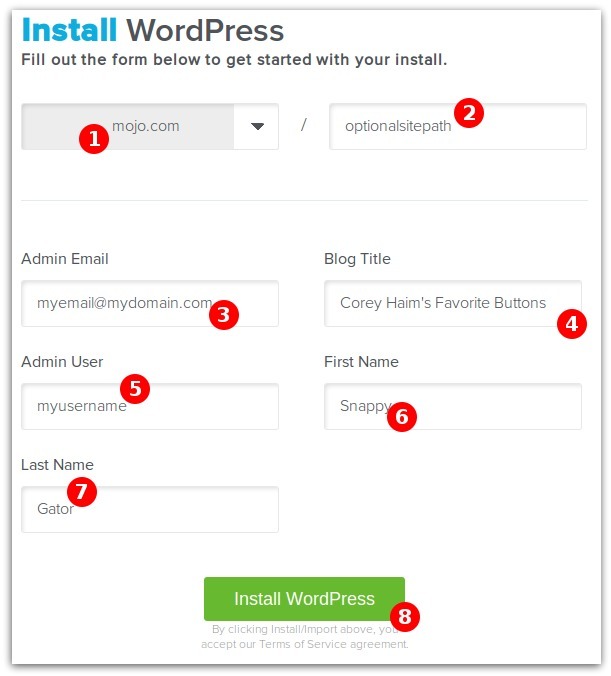 Next, you’ll be at the WordPress install screen. 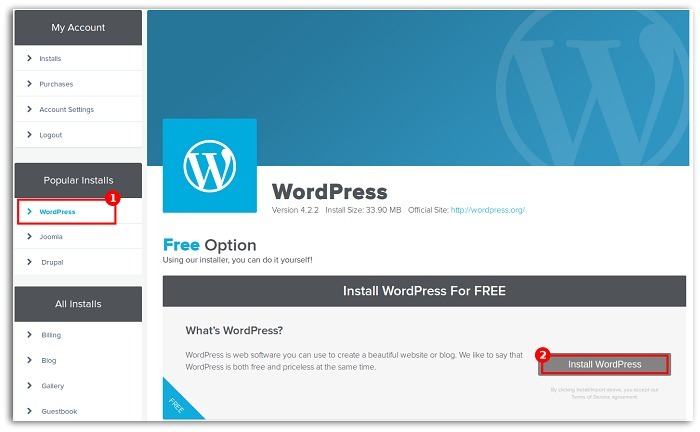 Choose WordPress on the left under “Popular Installs” and click “Install WordPress” on the right to move forward. The sub directory you would like the site to load from, if desired. You probably want to leave this blank. Example: Should you wish your WordPress URL to be mydomain.com/site instead of just mydomain.com, you would enter “site” in the box. For Admin Email, enter an email address where you want the admin password emailed to. Make sure this is a working email address that yo have access to. 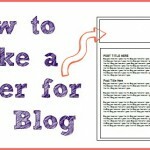 For Blog Title, enter the name of the website. This is what will appear in the header as the name of your site. You can change this later if you want. For Admin Username, enter your preferred user name. Do not use “admin”, as it is easier to hack accounts with the username “admin”. Bookmark that url, it will be the page you go to when you need to login to your WordPress dashboard. Login to your WordPress and you’re good to go! You’ll see a screen that looks like the one above. That is your WordPress dashboard. Hold your mouse over the “Posts” option and a new dropdown menu will appear. Click New Post and you’re off and running! To delete the original post that they put there, click all posts and you’ll see an option to trash that “Hello World” post. Aaaaaaand that is how to start a blog that is self-hosted on WordPress. Whew! We made it! Was is easy? Do you have questions? Leave a comment below, email me zack@morefromyourblog.com or catch me on Twitter @RealZackReyes. I’m happy to walk you through this process! Now that you’re in WordPress, you’ll want to browse around the available themes and choose one that works for you. There are free themes and premium themes. I recommend jumping right in with a premium theme. It’s easy to use the freebies, but the premium themes are so much more functional, user friendly and SEO friendly that you don’t want to ignore them. First and foremost, I recommend a Genesis theme (this site runs on a Genesis theme) because of the functionality, moderate price and ease of use. Thesis is also a good premium theme with a lot of functionality. Rest assured, the hard part is out of the way. Now, it’s up to you to start providing great content, driving people to your blog and making the most out of your new venture! Thank you for sharing this step by step instruction. I like Thesis theme. It is totally customized. Do you have any other hosting service recommended except BlueHost? No problem! Glad you like Thesis, it’s definitely one of the best available options. As far as other hosting companies, I also like HostGator which is very similar. Also, since we’re talking WordPress sites here, WP Engine is one of the best because it is tailored around WordPress, but you’ll pay a bit more. I just want to mention I am a beginner to blogging and absolutely love this blog. More than likely I’m going to be visiting your website daily. Thanks for having this blog. Awesome post. The hard part is getting started and getting through the technical aspects of configuring hosting, installing wordpress onto your server, etc. This article does a splendid job at walking you step by step through the entire process. Once you’re done, you’ve got the hard part out of the way. Now you just have to write about what you love! You’re right about that one! Once the steps in this post are done, it’s smooth sailing! Hey Zack, I’ve been using blogger platform and currently thinking of upgrading to something super-awesome like WordPress. I came across this post and I think, I’m done hunting. This easy-breezy post will do good for me. Thanks! Happy to hear you’re going to make the switch. Come back and share your new domain when you get it set up! Thank you so much for this! I found your (and your wife’s) blog via Google search and I’ve been using both of them to reference my blog-building process! I’m excited to enter the world of self-hosted blogging and see where it takes me. Thank you again for making this so easy for a beginner. Awesome, happy to hear it! Welcome to the self-hosted world – it can be a fantastic place!